It looks like the cold snap is over, for now. And my field beans have thick roots poking through the bottom of their pots. So, crossing fingers, chucking salt over my left shoulder, the navy bed’s been weeded, thinly manured, mulched with rotting leaves and planted up. 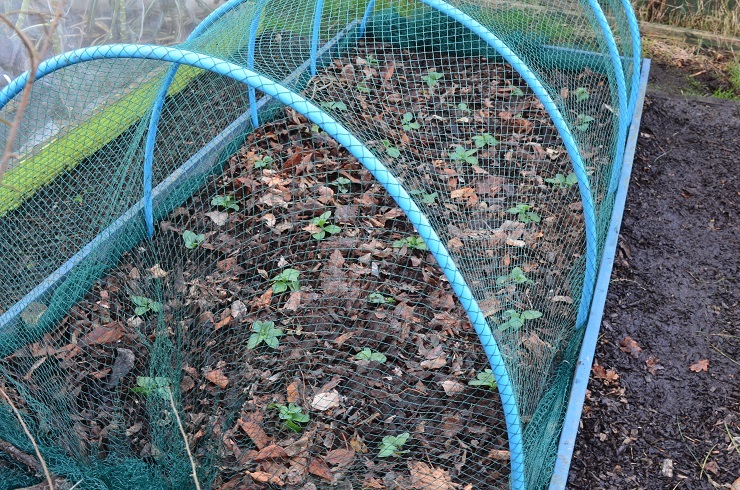 I’ve put netting* over the beans for now, just to keep curious jackdaw beaks from pulling them up to see what’s underneath. Clearing the navy bed also meant harvesting what was in it. As a reminder not to get too cocky, and that not everything goes to plan, this is a photo of the Harvest of Embarrassing Pathetitude. It includes all my winter carrots from the greenhouse. 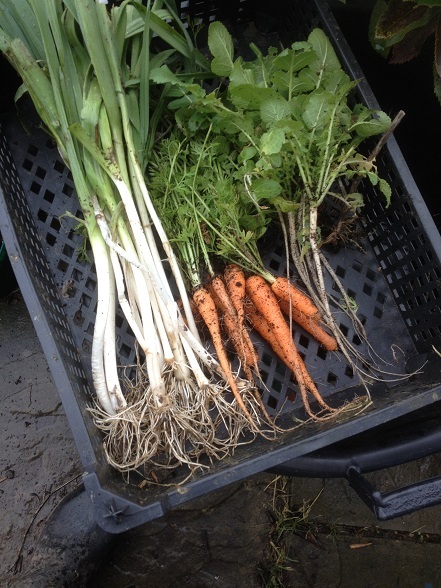 The leeks are spring onion size and the wispy white.threads next to the carrots should have been mooli. I didn’t even bother snapping the beetroot, they went straight to the compost bin. At least the PSB and kale are marching on. The kale even looks like it’s about to develop flower shoots – which means the crop’s nearly over, but they are so tasty steamed and buttered. Once the slugs have been flicked out, obviously! There’s been a massive, steaming delivery of manure to the site. I saw it yesterday and figured I have a very short window to snaffle some before it’s been spotted and carted off by everyone else. It is really hard work shoving a loaded barrow over a muddy track! My back is really feeling it, but 3 of my daleks are topped up. At home my onions are starting to show their second leaves, which means they are nearly ready to go out into a mini growhouse inside my greenhouse. Hopefully that will be sheltered enough for them. More and more of the chillies are popping up. 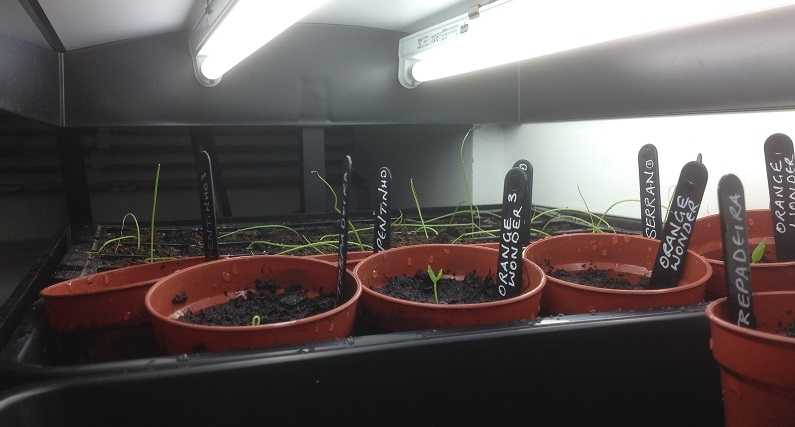 I have 10 seedlings under growlights, together with the unhappier tray of onions, getting 12 hours of ‘sunshine’ per day. It’s quite difficult to stop myself from sowing anything else. I just can’t wait to get started this season. 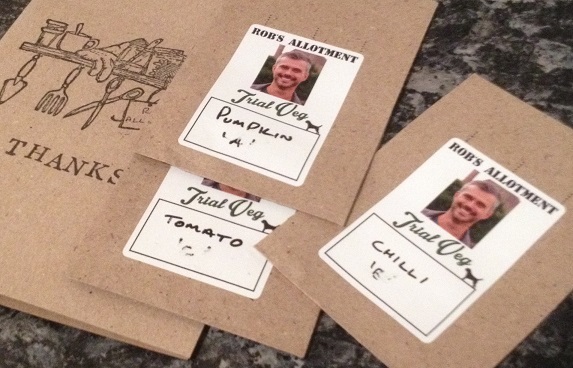 Amongst other things, this year I am going to be trialling some mystery seeds from Rob Smith, who won the Big Allotment Challenge in 2015. I have 3 kinds, a pumpkin, tomato and chilli. Am looking forward to growing them and seeing if I can guess what they are…Fingers crossed none of them fall foul of one of my brown thumbs moments!